Since its founding in 1981, students at Ireland’s respected Ballymaloe Cookery School have benefited from Darina Allen’s enthusiastic instruction and keen understanding of what makes food taste good. Now, readers everywhere can learn her techniques, tips, and shortcuts for creating delicious meals at home. Darina Allen begins with the basics by explaining what to look for while out shopping (organic, local, and in-season produce are favorites) and how to stock a pantry with quality ingredients and equipment. She demonstrates over 200 cooking techniques, from making mayonnaise to butterflying a leg of lamb, with clear instructions and step-by-step photographs. Both novice and experienced cooks will find plenty of new ideas and inspiration. By arming her readers with the fundamentals, Darina Allen prepares and encourages them to experiment and tackle new culinary challenges. 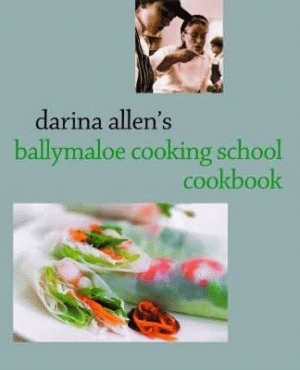 Darina Allen’s Ballymaloe Cooking School Cookbook is packed with mouth-watering recipes. Of course, there are traditional Irish favorites, like Watercress Soup and West Cork Rabbit Casserole, and classic gourmet dishes, like Boeuf Bourguignon and Ratatouille Nicoise, but Darina Allen does not forget busy modern families. There are several variations of pizza, barbecue, and cookie recipes, as well as instructions for freezing and reheating leftovers. Darina Allen has truly thought of everything, and she has included it all in this cookbook. Darina Allen runs the world-renowned cooking school at Ballymaloe, Ireland. Winner of the 2001 Veuve Clicquot Irish Businesswoman of the Year Award, Darina Allen lectures and travels extensively. She is also Ireland’s most famous cooking-show host, having presented nine series of her program, Simply Delicious, on television around the world. As a cookbook writer, Darina Allen has won the Langhe Ceretto-SEI Prize and was short-listed for the IACP Julia Child Awards. Other Pelican books that celebrate the cuisine of Ballymaloe are A Simply Delicious Irish Christmas, by Darina Allen, and The Ballymaloe Bread Book by Chef Allen.